Regular visitors to New College Library have probably walked past the Longforgan Free Church Ministers Library many times. 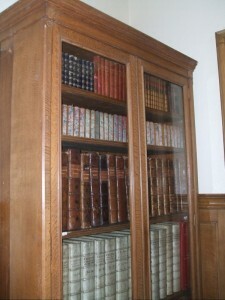 It sits in custom made glazed bookcases, which are sited on the landing of the entrance to the Library Hall and in the David Welsh Reading Room. The cataloguing of this collection is in progress as part of the Funk Projects, and we’ve recently been pleased to welcome Patrick Murray as our cataloguer, replacing Finlay West who has moved on to new projects. The Longforgan Library is an attractive part of the New College Library environment, but it’s probably true to say that for many years it has been just that – the books themselves have rarely been consulted. This may have been so from the very beginning – we’ve noticed that books being catalogued recently are in mint condition, some with pages uncut, as though they have never been read. This may fit with the Longforgan Library’s provenance as a gift to the Free Church at Longforgan, Dundee by Mr David Watson, owner of Bullionfield Paperworks at Invergowrie. 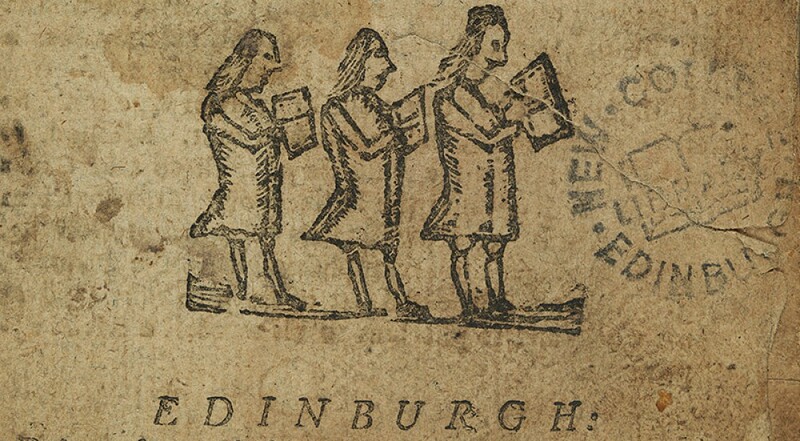 Part of the Longforgan Library could have begun life as a showpiece collection for David Watson to illustrate his skills in printing and binding to clients. 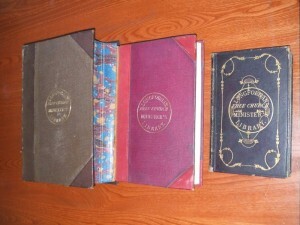 All this is changing with the benefits of online cataloguing. The Longforgan Library contains many volumes of the Acts of the General Assembly of the Church of Scotland from the seventeenth century onwards and the reports of the General Assembly of the Free Church of Scotland in the nineteenth century. For the first time these are being requested by readers, with telltale paper slips the evidence that the volumes are in use. More than that, online cataloguing has revealed the richness of this collection of patristic and theological books, the earliest text printed in 1618. The works of Eusebius of Caesarea and Irenaeus of Lyon sit alongside those of Jean Calvin and John Foxe in a microcosm of New College Library’s historic collections as a whole. And it’s held surprises for us – one of them being that we discovered additional books hidden in concealed compartments in the back of the bookcases. 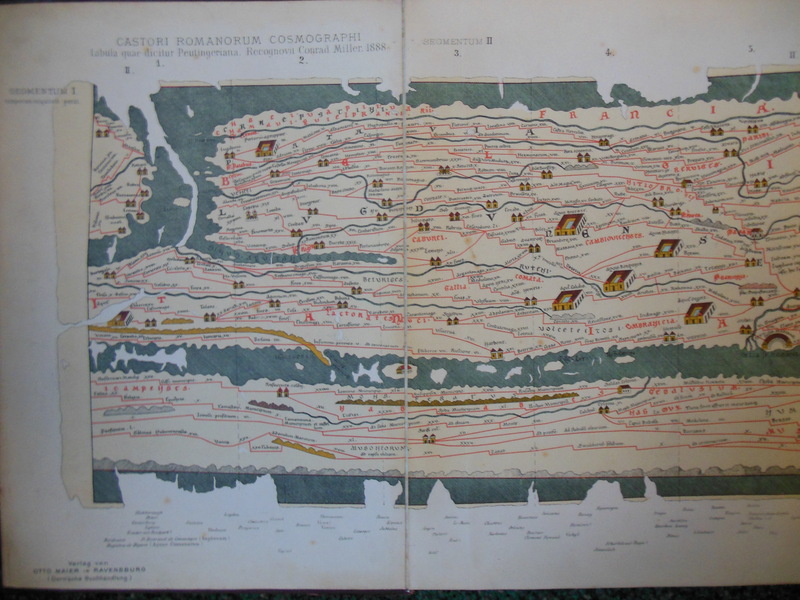 This included this fantastic facsimile of the Tabula Peutingeriana or Peutinger’s Tabula. 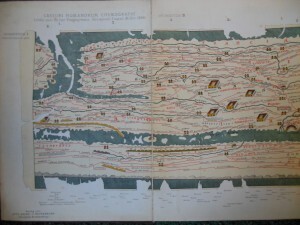 Based on an early fourth or fifth century original, the map covers the area roughly from southeast England to present day Sri Lanka and shows the Roman road network. 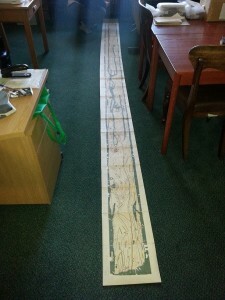 When we unfolded the map it stretched the length of the office! 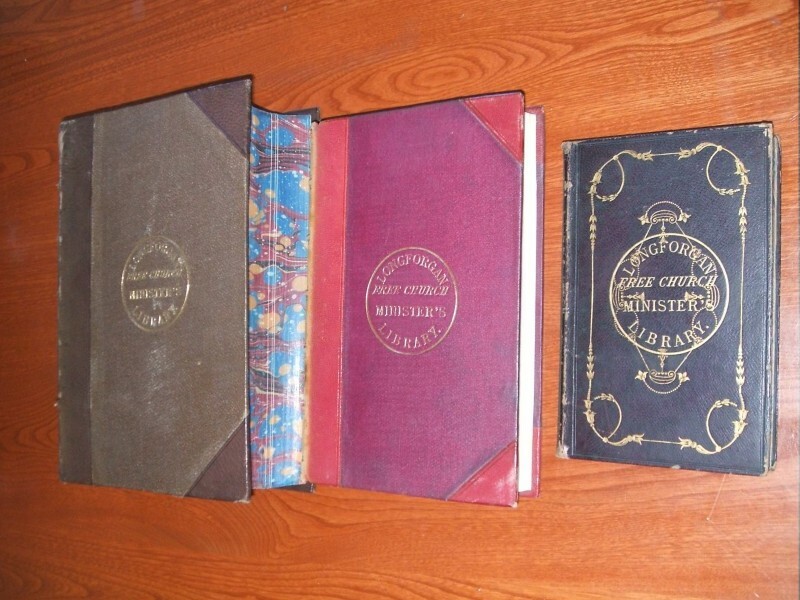 The Longforgan Free Church Ministers Library still has treasures to discover. There are cupboards yet to unlock which have books stacked back to back in them, plus there is a further sequence of Longforgan books in a more secure location which includes three early editions of the Babylonian Talmud. Watch this space.